Turkey trip or leisure yachts began to be produced in our recent history and to answer every request with a rapid acceleration measurement and quality boats have been manufactured. This classic wooden boat craftsmen in making the patrimony of the methods of modern technology blended with the comfort of a five star hotel appeared to be extremely excellent cruising yacht has emerged. While generally used in the manufacture of boats metal and wood fibers are also fabricated using various designs. We are professionalized in the manufacture of wooden boat, building has a lot of brain power with the latest in our fleet named Bright Mar 37 meter long by including our Gulet becoming a brand in this field continue our work . Wooden boat manufacturing pine, oak, mulberry, chestnut trees alongside locals like teak, mahogany trees fırınlanıp as imported trees are used in this process emperny extending the life of the boat is passing through . 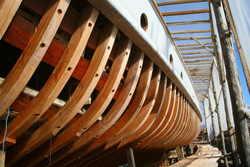 Boats optionally being produced and documented in various international standards . Production in the latest techniques are used. Boat cruises and boat rentals rapid increased in interest in recent years in this area are also highly increased production and made many boats in international markets besides domestic market is also easily to find a buyer . If you want to make a wooden yacht? First, the boat that best suits your purpose. The most important step would be the appropriate tree selection, according to boat size and characteristics of the production lasted until 10 to 24 months are made in time . Production techniques are implemented in laminate and are overhauled every step carefully over and over again . 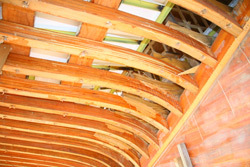 Boats from the beginning to the end of production in certain rules and standards should also be performed . Tree selection, implementation, machine motor systems, electronic circuits, sailing equipment, furniture and other components with the rather cumbersome, so in a pleasant task. It also provides high costs and therefore wrong to do mistakes in the application to return next power problems and bring costs increases . This is why the boat manufacturing experience with a particular company should be made. We are confident in this regard, and his most recent Temoh and Mr. Bright has proven himself in the field of M gulet with a capacity to meet all kinds of demands of being a company are carrying on. 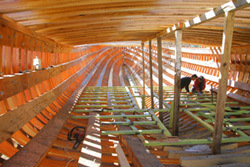 You have to be a day in a beautiful wooden boat and make it from scratch, you can interview with us, and we will be able to go through this with you for your boat of dreams.